Some would say that the Gerry Farnam Cross Country is the most prestigious race in the Irish XC calendar and arguably the strongest domestic race in the irish calendar. Its list of winners reads as a “who’s who” of the irish running. This year’s title went to talented youngster Michael Mulhare, Portlaoise from irish track specialist David McCarthy, West Waterford. In fact, three members of the 2010 U23 gold medal winning European cross country team filled the top three positions in the senior men’s race. However, the real interest lay in the fact that this race doubled as the selection race for the Irish Masters National squad to compete at next month’s British and Irish Masters XC International in Cardiff. 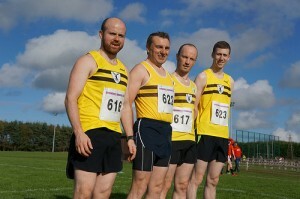 Three harriers made the trip to Phoenix Park and were rewarded with excellent performances. However, Paul Blaney will have to sit and wait for the selector’s telephone call. He finished 5th O/40 with an excellent 55th place in 28.05. Arguablly, the best run of the day belonged to Paul Elliot who finished 90th and first O/60 in 30:31. This follows up from his excellent performance in last month’s Bangor 10km. It was great to see that Cathy McCourt’s return from injury nightmare continues to go from strength to strength. However, she might have a selection dilemma as her second place in the F0/40 category would normally see her as an automatic selection for the Republic of Ireland Masters team. 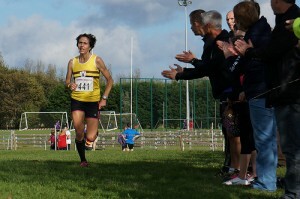 However, having won the NI Masters XC title last week, she may yet opt to run for Northern Ireland in Cardiff next month. Closer to home the domestic cross country season kicked off with the first league race on Saturday 19th October 2013 when runners turned out for the first Springwell XC race at the Ulster University Campus in Coleraine. There was a relatively low key turn out from the club. In the men’s race, Benny Teer stamped his dominance on the field with a strong win from Scott Rankin and Alan Bogle. Adam Boyd was 8th, Mark McKinstry 20th, Conor Shields 52nd, Martin Cox 61st and Mark McCallion 68th. Gladys won the ladies race from Michelle Sturm and Denise Toner. Full results are available here: http://www.nirunning.co.uk/Springwell_Coleraine_XC-2013.pdf and results of the junior races will be added when available. Parkruns saw large numbers of harriers competing around the province and in England. At the Waterwork, Brendan Grew won and clocked another sub 17 minute performance. He was followed by Mick Fitzpatrick in 2nd (17.27), Laurence Johnston 3rd (17.47) and Kent Swann bagged his “sub 18” in 4th (17.57). Other finishers included Jim Benson (18.34), Gerry Gribbon (19.01), Tony McCambridge (19.22), John Murphy (19.44), Greg McClure (19.56), Paul Williams (21.28), Matt Shields (22.01), Eamon Sheridan (22.08), Conor O’Rawe (22.34), Roisin Hughes (23.45), Mollie O’Hare (23.47), Niall Armstrong (23.52), Marian Hayes (24.49), Katie O’Hare (24.54), Lauren Cox (24.55), Jack Carberry (25.51), John Burns (26.59), Mary Ringland (27.30), Tina Haggan (29.25), Aaran McCann (33.40), Norman Patterson (41.29). Alan Ritchie was 2nd in Craigavon (18.22), James McKeown was 10th in Ecos (22.20), Jim Clinton was 23rd in Falls Park (25.59), Mark Shields ran 20.35 and Athanasia Sevastaki ran 21.14 at Ormeau Park. While at Queens playing fields, Philip Donnelly was 10th in 20.19, Ciaran Hunter was 25th in 23.35 and Drew Crawford was 38th in 28.22. Simon Reeve was 6th in Oxford Parkrun in 18.56. Finally, Martin Rea paced the sub 3 hour group successfully at the first PlusNet Yorkshire Marathon. Martin was an invited guest of Runner’s World and will also be pacing the sub 3.10 group at next Monday’s 2013 Dublin Marathon.